Fine Motor Skills are important to everyday activities such as tying shoes, writing names, and buttoning a shirt. Little hands need practice to develop these skills and strengthen hand muscles. 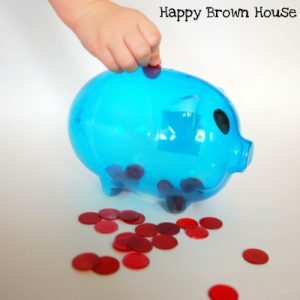 Developing Fine Motor Skills doesn’t have to be complicated, but it should always be fun! Use these tips and tricks to help your kids while they are developing fine motor skills. What Are Fine Motor Skills and Why Develop Them? 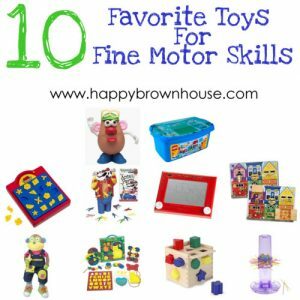 is a great place to start if you aren’t sure what fine motor skills really are or why they are important. Fabric Sensory Box for Toddlers–little fingers explore textures and practice pulling fabric strips out of a hole. Gel Sensory Bags–let little fingers explore textures and practice manipulating items. Rubber Band Guitar for Babies–let little fingers try to grasp and pluck the rubberbands to make noise. 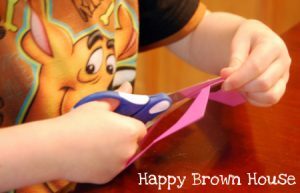 Essentially, I believe there are five basic movements that all fine motor skills activities revolve around–tearing, pinching, cutting, lacing, twisting. These basic movements are the basis for so many skills we use in our everyday life. 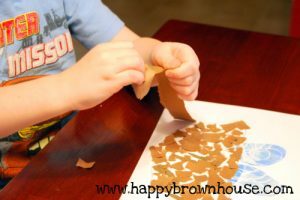 The Train Themed Unwrapping Activity from Craftulate is a clever way to use fine motor skills in an everyday situation. And let’s face it, what toddler doesn’t like getting into things? Rainy Day Drip Painting from Minne-Mama is a fun way to use medicine droppers and practice pinching fingers together. Button Sorting Cups from About Family Crafts is an easy way to practice pinching and color sorting at the same time. DIY Felt Button Chain is a great way to practice pinching and manipulating buttons. The Bubble Wrap Learning ideas from Meaningful Mama are a fun way to target a variety of skills. DIY Cardboard Construction Play Set from Happy Hooligans is a quick and frugal idea. Rubberband Passing Game–so much fun! DIY Chopstick Tongs an easy way to make a pair of tongs that will help practice squeezing hand muscles. Cutting tissue paper to make a Stained Glass Butterfly Art is always popular at our house. Pool Noodle “Beads” Lacing–Is there anything more fun than giant foamy beads for little hands? Toilet Paper Roll Lacing Tools–A unique idea for recycling toilet paper rolls. Baby Gate Weaving–large scale weaving! 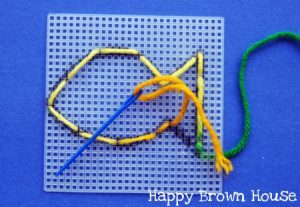 18+ Fine Motor Activities for Kids Using Yarn–great list of ideas! Feather Beading is simple and fun for kids. 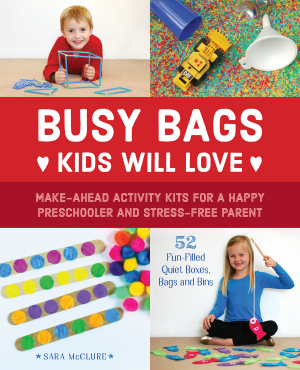 I love the Rainbow Lacing Busy Bag from Coffee Cups and Crayons! So cute! Heather from Crayon Box Chronicles and her son set up a DIY Geoboard with lots of twisting and then they played! Tie-riffic Fun with Twist Ties is a clever idea for using leftover twist ties from Learn With Play at Home. The DIY Latch Boards from My Life of Travels and Adventures are such a neat idea! Fine Motor Skills Wheels from Lalymom are so fabulous! Kids will love these, especially if you use the family pictures. 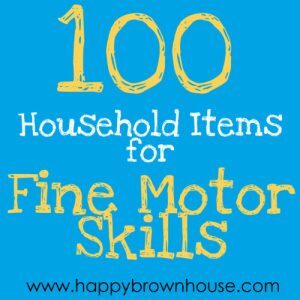 100 Household Items for Fine Motor Skills is a post I wrote that helps your take a look at normal household items in a new light and encourages you to use what you have at home to develop fine motor skills with objects children will use in day-to-day interactions. Homemade Playdough Recipe–my favorite recipe! Free printable recipe card included. 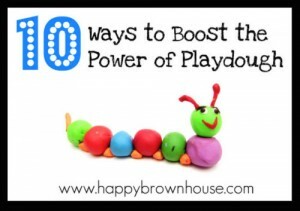 10 Ways to Boost the Power of Playdough–Think playdough is just rolling snakes? Think again. 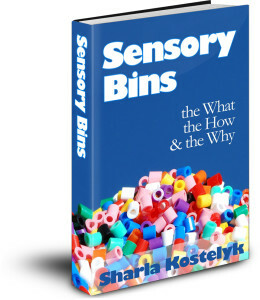 Sensory Bins: The What, The How & The Why written by my friend, Sharla. This ebook is a great place to start to get ideas and understand why sensory bins are perfect for little hands. While sensory bins have many uses, there are many fine motor benefits! Basic Shapes For Beginners: A Hands-on Approach to Pre-Writing Strokes for Preschoolers written by my friend, Heather. This book is perfect if you are just starting to work with your little one to develop pre-writing strokes. I have been using some of the activities with my youngest son. It is a great first step for little hands. Of course!! It had to be included! Holy moly ravioli, this is a super post! Pinned to my “children” board on Pinterest! Thanks for stopping by Marie-Claire! What a great resource for fine motor skills ideas! Kids have to want to do the activity or it’s a bust, so these fun ideas are perfect! Thanks for stopping by Emma! I agree, if it isn’t fun, there isn’t any hope for an activity! LOVE this! Thanks for such a great resource! I have pinned this on my Fine motor/ Handwriting board! 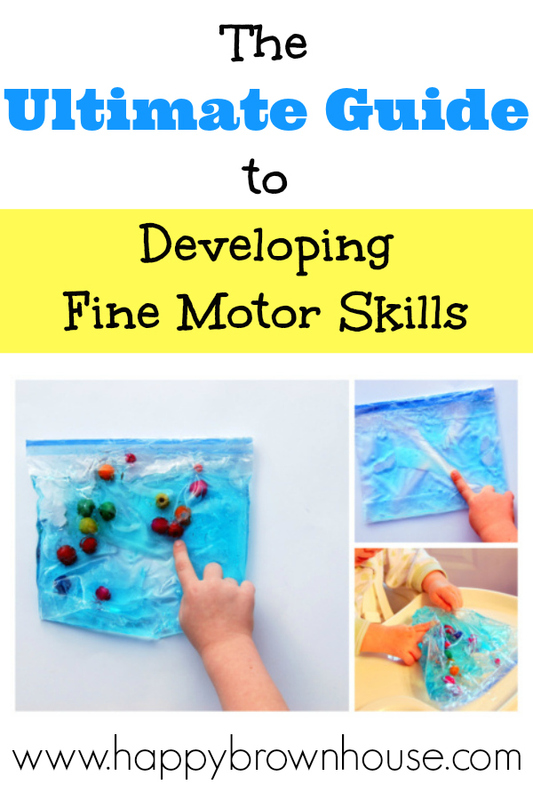 Great ideas for improving fine motor skills. I think I’ll put together a fine motor station here in my home preschool and use a lot of the ideas on this list. 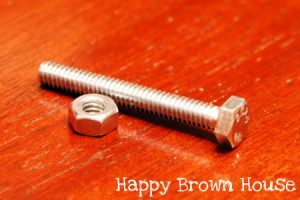 Thanks for the great post! A Fine Motor Station is a great idea!